I am back with my card for this weeks Whiff of Joy challenge, which is also a call for the next Whiff of Joy Guest Designer for 2 months. Dawn, Tina and Jen have done a fabulous job, but now it is time to say goodbye. Hier bin ich wieder mit meiner Karte für die Whiff of Joy challenge dieser Woche, die gleichzeitig ein Aufruf für den nächsten Whiff of Joy Gast Designer für 2 Monate ist. Dawn, Tina und Jen haben großartige Arbeit geleistet, aber jetzt ist es an der Zeit sich zu verabschieden. This weeks Whiff of Joy challenge also features one of my sketches (Thanks Donalda for letting me part of your fabulous team :) I used Willow with flower basket from the first Whiff of Joy / Elisabeth Bell Spring Stamp kit. I received a lot of mails letting me know how much you love your spring kits which made me extremely happy and is very much appreciated :) Thanks a lot! For all of you who missed the pre-order of the spring kit - all the stamps will be available as single stamps tonight through the Whiff of Joy online store. Für alle, die die Vorbestellung des Kits verpaßt haben, keine Bange. Alle Motive wird es ab heute Abend auch einzeln im Whiff of Joy online store zu kaufen geben. I did the scalopped border with a SU punch and stamped the little signs with the coordinating SU stamp set. Den gewellten Rand habe ich mit einem Stampin' Up Stanzer gemacht. Die kleinen Zeichen kommen aus dem passenden Stempelset von SU. I coloured Willow with water-soloble pens from Caran D'Ache and Twinkling H2Os. I used glitter pens from Spica to colour all the small details of the image and a white gel pen to highlight certain areas. Coloriert habe ich Willow mit Supracolor Aquarellstiften von Caran D'Ache und Twinkling H2Os. Mit Glitzerstiften von Spica habe ich all die kleinen Details des Motivs coloriert und mit einem weissen Gelstift Akzente gesetzt. The sentiment is from the Whiff of Joy "general sayings" set. I used Spellbinder's petite circle Nestabilities to cut it out. Der Text ist von dem Whiff of Joy "gebräuchliche Texte" Set. Ich habe Spellbinder's petite circle Nestabilities benutzt um ihn auszustanzen. This is absolutely gorgeous Katharina!! Love this new image and the colours are beautiful! Beautiful card Katherina, the image is just gorgeous. Beautiful card. I love that image! I recieved the spring set the other day and I'm so looking forward to making something with them - they are gorgeous! woww Katherina,what a beautiful card,l love the image. This is stunning! Love the coloring, and your sketch is wonderful... my stamp club just arrived this morning.. and now I see a sketch by you... I JUST Have to do this one! Die Karte ist ja Wunderschön, ich habe mir auch das Kit bestellt, aber es ist leider noch nicht da. Ich warte schon soooo sehnsichtlich. Hello Katharina, I love the wonderful creation and I love the layout. Oh she sweet Katharina!! 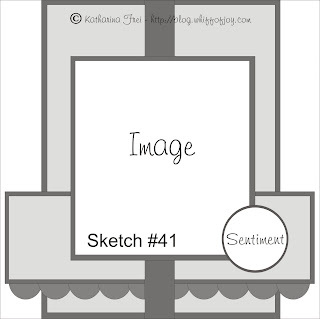 gorgeous card and a wonderful sketch!! OMG...I received my Spring Kit yesterday afternoon and the rest of the world is just going to have while I stamp and play for a while. These are amazing and so worth waiting for. Thank you so much for all of your great products time & again. Your card is Just lovely. Such a stunningly beautiful card, Katharina! I got my Spring Kit, which I won, yesterday in the mail...YAY!!! I am soooo ecstatic! Each image is so beautiful but I think this little girl is my fave,smile!!! You're colouring is exquisite and I just love this sketch!!!! Beeeeautiful card Katherina-you have inspired me-I ordered my some of your stamps for the first time last night although -the start of a new addiction I'm sure! Such a beautiful card and adorable image. I just got my spring kit the other day, but have been too busy to stamp. I hope to make one tonight. I am so excited that you are having another guest design team call! I would LOVE to be a guest designer!! The problem will be choosing which gorgeous stamp to use!! I love your card! I love the way you've coloured every detail. I've made my first WoJ card ever using this sketch. 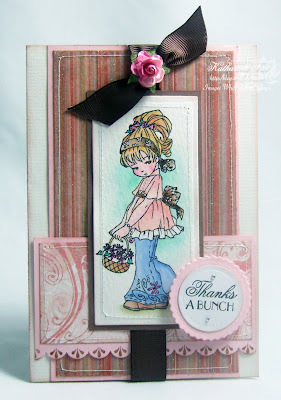 Oh Katharina, Willow looks fabulous and Im loving all the new stamps including the Spring Kit. Your card is fabulous hun and I love the pretty rose ~ gorgeous. Thanks for such a fabulous sketch, I had lots of fun !! This is just so beautiful!! I am totally in love with my spring kit!! 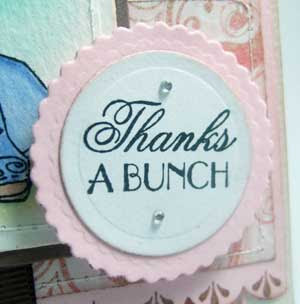 Thank you so much for the beautiful stamps that you provide for us to use. Your blog and cards are just so amazing. The coloring is absolutely wonderful. I aspire to color as beautifully as you one day. I just love all of the Whiff of Joy stamps. The spring kit is so beautiful. I love it!! Wow,dass ist eine echte Traumkarte! Eine wunderschöne Gestalltung und sehr schöne Farben!